"Background: I love NARS and the Add-On set, but I don't like their lack of focus. It feels weird to me to have PRR duplexes, CP Jubilees, and SP Cab Forwards all running on one railroad. Additionally, there are some serious gaps in their steam line up. My favorite era is right around 1920, and I usually keep my game within a few decades of that year for its entirety. (Either cheating the date or using a long day length.) This works fine as is, but the problem is that old engines don't get updated anymore. In NARS 2.03, steam engines would evolve over time, so a 2-8-0 built in 1914 has far stronger stats than the one built in 1868. In NARS 2.51, you have old time wood burners, then some updated coal burners, and then it goes straight into modern road engines like mikados and berkshires, etc. 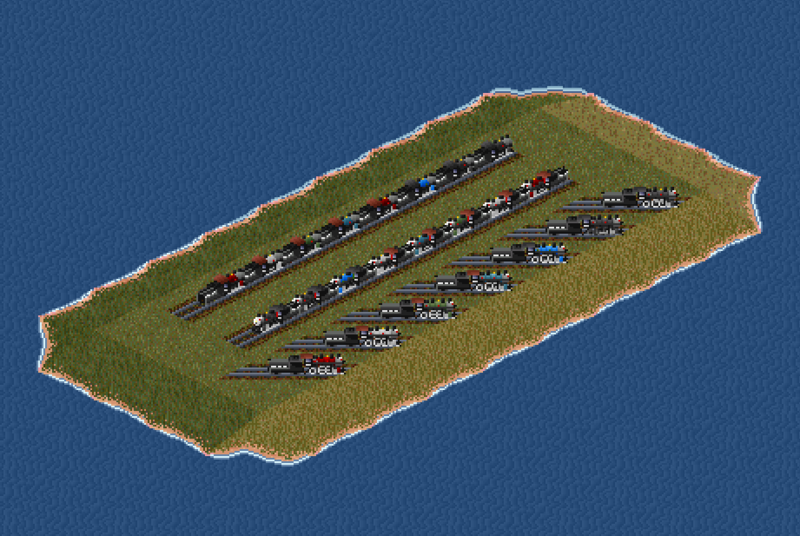 "The problem with this is that when I'm starting my game in 1920, I have to choose to either way overpower my trains with giant (for the time) engines like 2-8-2s and 4-6-2s, or buy 1800s era engines that look out of place hauling current cars and have awful stats. "My solution is to create a new pack that goes into much more detail, offering various flavors of different wheel arrangements from different eras. For example, the first 4-4-0s looked very different from the express engines of the late 1800s, which looked very different from the later superheated versions. This is true across almost all wheel arrangements. "My method of execution would be to take my favorite railroad, the Southern Pacific, choose representative classes from each wheel arrangement and era, and then create models for each class. Many of them would look the same, many would have very similar stats, but you'd get a huge amount of variety while maintaining a very uniform family look. My sources would be steamlocomotive.com for stats and espee.railfan.net for photos. "I'd also like to make freight and passengers cars to fit the SP theme, including variations such as diners, sleepers, RPOs, etc. I have some ideas for this, which I'll go into if and when I make them. "I'd also like to include their narrow gauge trains, and maybe some classic stations in SP colors as well." Well, I've got too much time on my hands, so here's my first version! 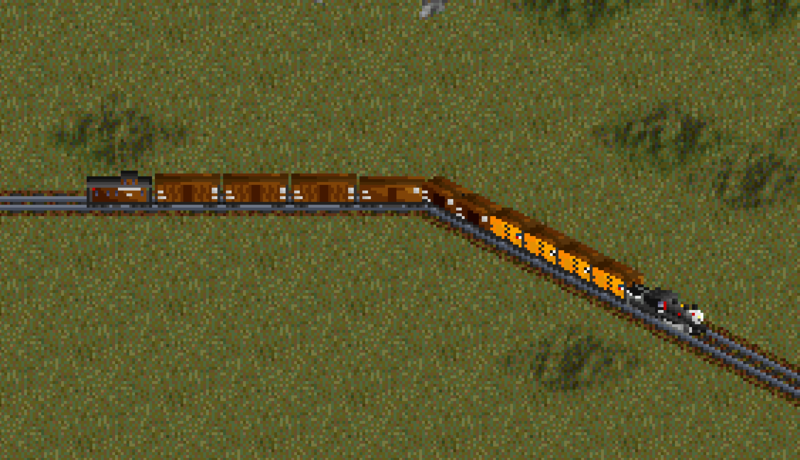 It's mostly a proof-of-concept and a proof-of-my-ability-to-actually-finish-and-release-things, so I only have one locomotive so far: the SP A-3 4-4-2. The A-3 is my favorite, and I also happen to be building an N scale model of it, so I have a lot of notes on its exact construction, as well as a model to reference for drawing sprites. I've implemented it in seven liveries, created a custom repaint cargo, and implemented dynamic running costs. So I'm pretty happy with this and ready to keep going! Next will come a caboose, then probably some passenger cars, then a light freight engine like a mogul, probably an M9. The license right now is restrictive, since it's barely out the door, but eventually I plan to release it freely and I'm also open to collaboration. I have 68 standard gauge engines and a number of narrow gauge ones planned, so more hands would not be unwelcome. Here's version 0.2. I've added a mogul, a caboose, and four flavors of passenger car. Next is probably another freight engine of some kind. Oh now this is cool. I spent a good part of my childhood on the SP's Ventura Sub (Carpinteria) so the Espee has a special place in my heart. Very nice. The "repaint" cargo still feels like a bad idea, but it's probably less of an issue than it used to be now we have 64 cargos per game in recent nightlies. If you're interested, the NARS1 and 2 sprites are available to download here. Feel free to use or modify them in any way you like. Actually, this grf evolved from another one in which I pretty much just ripped NARS sprites out of the game using screenshots of the sprite aligner, haha. Although I also used other sprites by people who didn't want me using them so I decided to draw my own for a public release. Thanks for the offer though! Also in that grf, I actually gave each engine a passenger capacity of 1 for repaint purposes, but unfortunately it screwed up the cargo distribution network and I ultimately decided a special cargo was better. It should help to have 64 cargoes too, as you said. There's a way to use passengers as the repaint cargo but at the same time have a capacity of 0 so that it won't affect cargo distribution. It's how the Dutch Trainset and others do it. in the graphics block. This means your vehicle shows as carrying passengers in the purchase and refit menu, but otherwise it acts normally. Hope this helps! Anyway, here it is! This is a big jump from the last version. 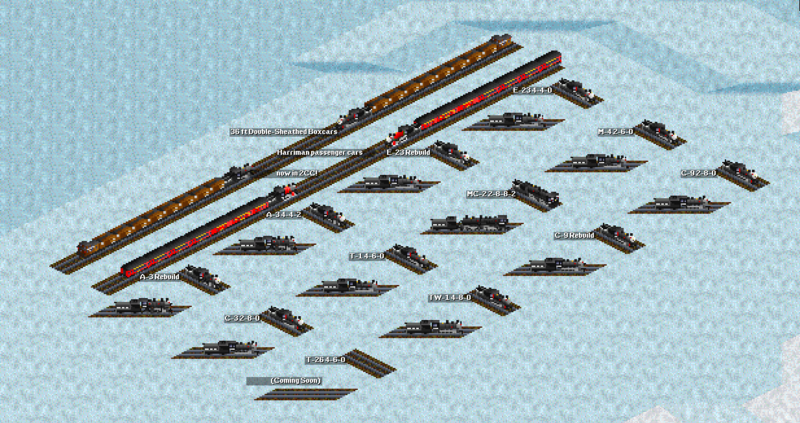 I added 9 new engines, although 3 are rebuilds, and a boxcar. I also allowed the Harriman cars to be refit to 2CC. For the early 1900s, this set should be at least somewhat playable now! BaNaNaS is updated to the latest version now too. I forgot to upload 0.2, but 0.3 is live. *	NEW:	T-32 4-6-0 in black, CC, and four colors of Russia iron. *	CHANGE:	Adjusted all engines' maximum speed to match that shown in the diagram book. Two more reason I have as to why I dont have a lot of steam engines in my set : Lack of information/data and a lack of sprites. I have a few sprites for some steam engines that still need to be coded but I've just been busy with school and doing other things. Hey! I made an account on this site recently just to comment here. If I could recommended anything. . . Whenever you do create sprites for the MC, AC, MT, MK, P, GS classes you should do more than just one generic sprite for each of them. Instead you might want to consider creating sprites with/without streamlining, and types in general like how there's an MT1-5, GS1-8, and so on. It would be super cool to see that kind of variation in aesthetic and power, speed, weight, price, introduction/lifespan, maintenance and such, as they all preform differently! I can't wait to see how far this set goes!